Borderlinx | Buy Mr Porter and ship worldwide with Borderlinx. Cheap rates guaranteed. As a first class global online retailer, Mr Porter offers high quality clothing, shoes and accessories, for men only. Part of the Net-a-porter group, Mr Porter sells the most famous and luxurious fashion brands like Gucci, Givenchy, Burberry, Lanvin, Alexander McQueen, Dolce & Gabbana, as well as new up and coming designers. Mr Porter makes suggestions according to a man's style and sensibility and provides a bespoke customer service. You want to buy from Mr Porter UK and have your new fashion items shipped right to you? 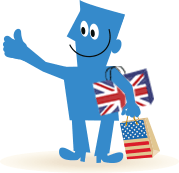 Order from Mr Porter in the UK and have it sent to you overseas with Borderlinx! Shipping, tax & duties can be calculated beforehand with our Shipping cost calculator, so you don't run into any surprises. A number of services are available through Borderlinx to make international ordering from Mr Porter hassle-free, including concierge, free repacking and consolidationservices.